Jerwin Ancajas one of the top prospect in the Philippines for the flyweight division will join Manny Pacquiao on November 22, 2014 at Cotai Arena, Venetian Resort, Macao, Macao S.A.R., China. 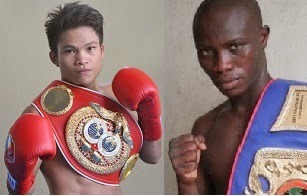 Ancajas will face Fadhili Majiha of Tanzania for non-title 8th round fight. Anjacas a fighter from Cavite, ranked no. 8 in the Philippine in Flyweight division and ranked no. 42 in ther world. Now with the record of 21 wins and 13 wins by way of KO and 2 loses will try to beat the 21 y/old Fadhili Majiha from Tanzania. Ancajas won his last 6 fights all by way of KO. About Fadhili Majiha, he also has a good record of 15 wins, 7 wins by way of KO and 5 loses. He is the ranked no.1 in Tanzania in flyeweight division, his last two fights was a loss by the Filipino Marlon Tapales of Philippines last June 2014 and Pungluang Sor Singyu of Thailand last October 2014. This match is a step up fight for Anjacas, he will fight in front of Manny Pacquiao and Algieri fans. Goodluck to Manny Pacquiao and Anjacas on November 22, 2014 bout.